AT&T continues to push their "final" contract proposal with its misleading summary and inaccurate calculator directly to CWA members, violating the National Labor Relations Act. CWA's bargaining teams have rejected this "final" proposal from AT&T, and have filed Unfair Labor Practice (ULP) charges against the company for this attempt to circumvent the collective bargaining process. Members continue to work without a contract while AT&T refuses to reach a fair agreement that will keep good, family-supporting jobs with affordable benefits in our communities. 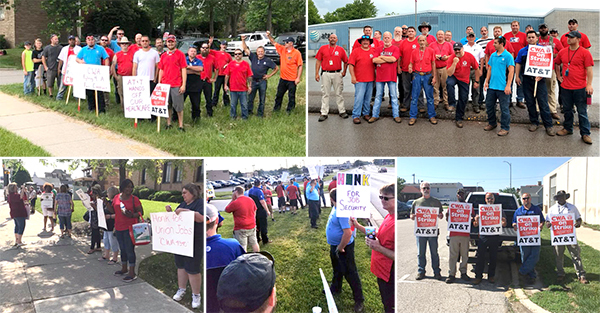 Locals continue to mobilize for a fair contract and many members have participated in grievance and unfair labor practice strikes over the past few weeks. Many CWA locals have participated in grievance and unfair labor practice strikes over the past few weeks. Digital First Media management came to a bargaining session empty-handed, telling NewsGuild-CWA representatives this week that the company's hedge fund ownership intends to keep worker pay frozen to help maintain its profits. Alden Global Capital, principal owner of Digital First Media, has earned worldwide notoriety for its ruthless staff cuts and double-digit profit margins. On Thursday, DFM attorney Marshall Anstandig said, "I can't sit here and apologize for the fact that we are profitable and our owners want us to be as profitable as possible." NewsGuild representatives say they will consult with members to decide how to proceed. No new bargaining dates have been set. U.S. 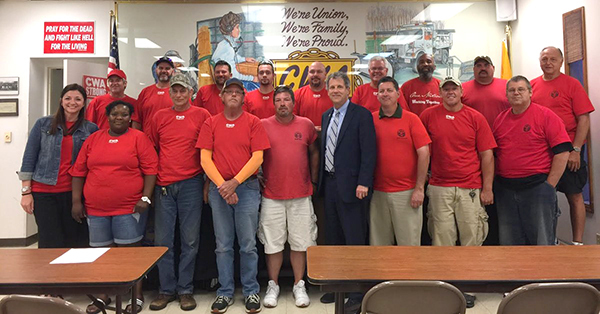 Senator Sherrod Brown (D-Ohio) joined 30 call center workers from CWA Local 4322 in Dayton, Ohio, this week to call for action on his legislation to help rein in offshoring and bring call center jobs back to the United States. Senator Brown is a cosponsor of the United States Call Center Worker and Consumer Protection Act, which would make U.S. companies that offshore their call center jobs ineligible for certain taxpayer funded grants and loans, give U.S. consumers a right to know where they are calling and to be transferred to a U.S.-based location, and create a public list of companies that offshore call center jobs. "Most Americans want to support American jobs by buying American whenever they can, and that includes the customer service they get from call centers," said Brown. Democratic Senators alerted President Trump to the need for action on protecting call center jobs last year, but instead of working to reduce offshoring, the Trump Administration backed provisions in the Tax Cuts and Jobs Act that provide incentives for corporations to send jobs overseas. Many of the companies that are the biggest beneficiaries of the Republican tax bill, including AT&T and Wells Fargo, have been closing American call centers and aggressively offshoring U.S. jobs, especially in the call center and customer service industry. "My job is extremely important to me, my family, and my community. My call center employs around 300 middle class Ohioans," said Renee Rouser, a call center worker and member of CWA Local 4322 from Youngstown, Ohio. "These are good, valuable, middle class jobs that should be staffed by qualified U.S. workers and not sent overseas where workers earn poverty wages." U.S. Senator Sherrod Brown (D-Ohio) joined call center workers from CWA Local 4322 in Dayton, Ohio, this week to call for action on his legislation to help rein in offshoring and bring call center jobs back to the United States. In a victory for workers at General Dynamics Information Technology, Inc. (GDIT), who are organizing to gain a voice in their workplace with CWA, the company agreed to a settlement that overturns 2017 union election results at its Alexandria, Va., facility that were tainted by GDIT's union busting activities, and requires the company to send a notice to employees pledging not to engage in illegal anti-union activities in the future. In the notice, GDIT pledges not to lie to workers by telling them voting for union representation is futile because it would take an "act of Congress" to increase their wages (a claim that GDIT has made before); not to threaten employees with the loss of financial benefits; and not to engage in other anti-union intimidation tactics. The promises in the notice may have wide-reaching implications for GDIT workers in their continued fight for better working conditions. GDIT is required to refrain from the type of union busting addressed in the notice at all of its facilities around the country. Sabrina Batts-Hopson, a customer service professional at the Alexandria facility said, "We feel vindicated by this settlement. We knew what management at GDIT was doing was wrong, and we didn't believe we got a fair election. We're happy the board found merit to our charges and that GDIT has agreed to stop spreading misinformation to its workers." Since January, more than 2,000 current and former GDIT call center workers have come forward to call on the Department of Labor (DOL) to investigate violations of prevailing wage law at the company. CWA members, led by CWA District 6 Vice President Claude Cummings, Jr., who heads CWA's Human Rights Program, attended the Coalition of Black Trade Unionists' annual convention in Orlando, Fla., which focused on engagement and mobilization on issues including economic justice, civil rights, environmental justice, and restorative justice. NewsGuild-CWA and National Association of Broadcast Employees and Technicians-CWA (NABET-CWA), which represent 30,000 reporters, photographers, and broadcast employees, are praising a bill filed in the Senate by Sen. Richard Blumenthal (D-Conn.) and Sen. Bob Menendez (D-N.J.) last week that would make it a federal crime to assault a journalist. A similar bill was introduced in the House by Rep. Eric Swalwell of California in February. "Journalists put themselves in danger in order to keep Americans and the world informed," said NewsGuild-CWA President Bernie Lunzer. "The Journalist Protection Act deserves the support of everyone who believes our democracy depends on a free and vibrant press." The bill comes just days after several reporters were barred from a public meeting convened by EPA Administrator Scott Pruitt addressing harmful water contaminants. Security officers grabbed a reporter for the Associated Press by the shoulders and shoved her forcibly out of the EPA building after she asked to speak to an EPA public-affairs representative, the AP reported. Charlie Braico, president of NABET-CWA, said, "The Journalist Protection Act will permit the authorities to properly punish people who attempt to interfere with our members as they work in dynamic and challenging newsgathering situations."